The Vortex Optics Solo 10x25 Waterproof Monocular. The accessories are well constructed, although the case’s material is a bit disappointing. While the case is decent, it appears that Vortex Optics forgoes its premium quality for an unimpressive elastic material on the case’s sides. The manufacturer has been known to offer products that embody the best designs and built with robust materials, so this is definitely a step back for the company. What is Vortex Optics Solo 10x25 Monocular Magnification capacity? ​The Vortex provides an incredible 10X magnification, which is backed by a small 25mm objective lens. You can take in tiny details, thanks to its amazing clarity and resolution, which compared to other monocular models, gives it an edge. ​What kind of optics can you expect from the Solo 10x25 Monocular? 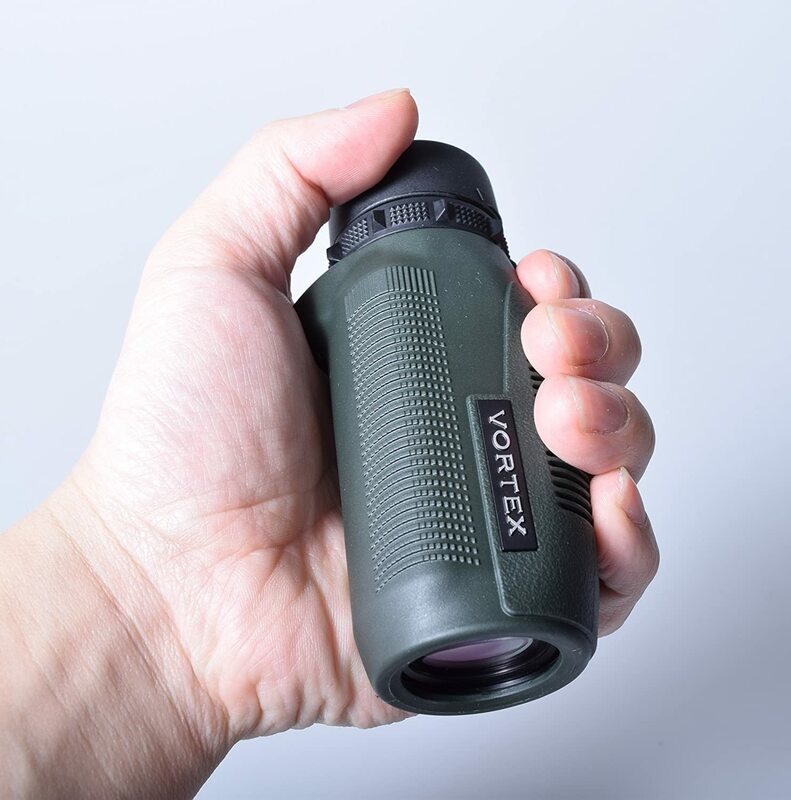 ​The Vortex Optics Solo 10x25 Waterproof Monocular boasts lens optics that are fully multi-coated, along with air-to-glass surfaces coated with multiple anti-reflective material, to transmit maximum light for even brighter images. ​Its close focus is little more than 16 feet, with an eye relief of 14.5mm that should be comfortable for most eyeglass users. ​Like most vortex optical products, the monocular is integrated with a prism optical system which not only contributes to its compact size but also its longevity. The lenses are encased in O-rings to protect them from damage when exposed to water, debris or dust. ​Vortex distinguishes itself from the plethora of monoculars on the market by making the Solo 10x25 waterproof, fogproof and even shockproof. The optic is nitrogen filled, promising great image quality no matter the weather conditions. I can attest first-hand, that the monocular performance will remain consistent whether there is rain or snow. ​What about its Field View and performance in low-lit areas? ​The field view of the Vortex Solo monocular 10x25 configuration is 315 feet at 1,000 yards, which is pretty good for such a portable device. The Solo eyecup is adjustable with a twist up and down style that allows you conveniently change your viewing as desired, from either fully up or fully down positions. This caters to the comfort of those who use or don’t use eyeglasses, although in my experience, if you wear eyeglasses it may take a while before you get the hang of it or even make it work for you. ​Its 25mm objective lens combined with 2.5mm exit eye, allow a lot of light, which maximizes the viewing experience. This can come in handy when using it in particularly low-lit conditions. ​What can you expect in terms of build and design? 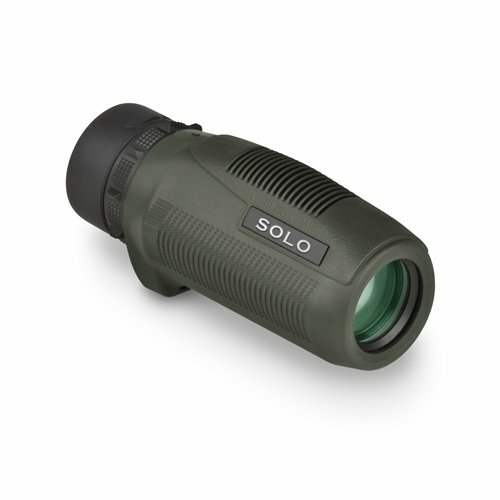 ​The Solo 10x25 Vortex optic is built with durability in mind, enclosed in a rubber and plastic construction. Its layer of rubber armoring is built to last, offering both convenience and protection. The rubber provides a secure grip in any weather condition. Its tough plastic material is commonly used by Vortex, to provide durability combined with light weight. ​Weighing less than 6.0 ounces or 170 g, the monocular is light enough to almost forget its dangling from your neck when you’re out and about. Size-wise, it is 2.23 inches wide and 4.43 inches long, with a hand grip of around 1.83 inches to easily and comfortably fit in your hand. For any travelling or hunting enthusiast, the monocular is would definitely be the perfect addition to your gear, as it takes almost no space and packs less than a binocular. ​How durable is the Solo 10x25 Monocular? ​The rubber armor housing the Vortex Optics Solo 10x25 monocular doubles up as a shock absorber, protecting the optics enclosed within from accidental drops or bumps. During my field tests, I accidentally dropped it once or twice off a cliff; and it survived with just a few scrapes and scratches. The optic was still in good working condition. 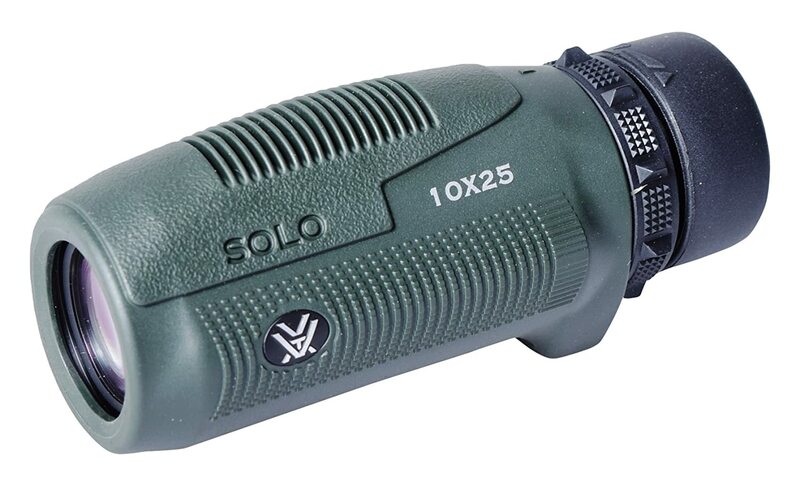 ​It is also worth mentioning that the Solo 10x25 monocular is complemented with Vortex’s VIP lifetime warranty. The warranty is transferrable, meaning it can be passed from one owner to another, without losing its validity. 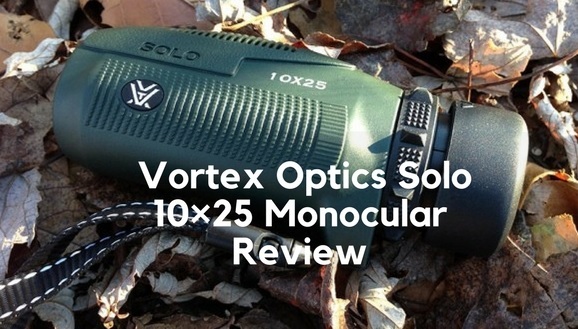 ​How does the Vortex Optics Solo 10x25 Monocular fair in the field? ​The Vortex optic performs surprisingly well, for a monocular its size. It has proved more than efficient for my field deer hunting and shooting range activities. Case in point: While out on one of my hunting trips, I noticed movement at a distant bush but couldn’t make out what it was from my crossbow scope. So I reached for the Vortex Optics Solo 10x25 Monocular, and true to its promise of performance, I could clearly see a deer grazing at about 100 yards away from where I had positioned myself. To get a clean shot with my crossbow scope, I used the monocular to find the perfect spot closer to the deer. Without the Vortex Solo Optics, I would have probably missed my shot. I can honestly say, it has become part and parcel of my field hunting escapades and even my backpacking trips. Durable with a lifetime warranty. Elastic material on the sides of carrying case is lacking. Eyecup offers minimal performance with eyeglasses. I can comfortably recommend the Vortex Solo 10x25 Optic monocular, as a good investment for those who need a highly powered monocular bundled in portability. 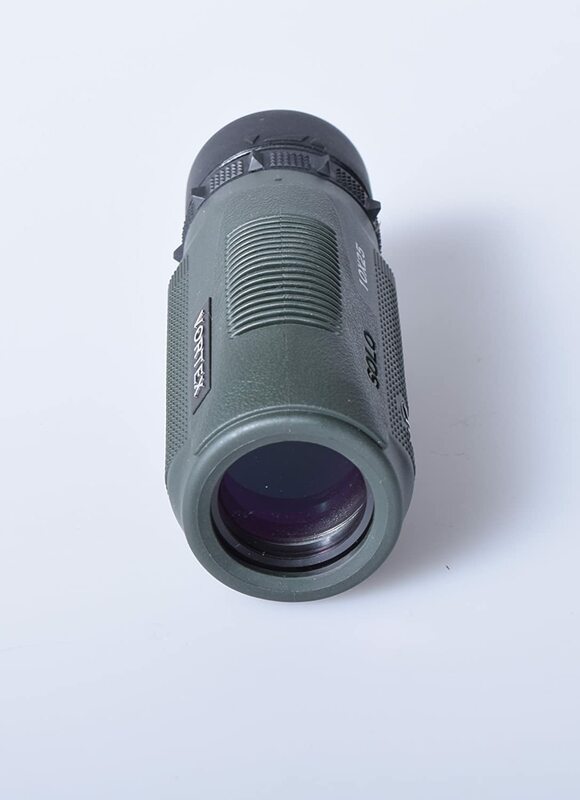 Stadium sports enthusiasts, hunters, backpackers and even bird watchers, will find a trusted optical companion in the waterproof monocular.With 10X magnification, and a field view of 31.5 feet at 100 yards, you are guaranteed clear, bright images in good contrast and fantastic resolution. The optic’s great features, a lifetime, transferrable warranty, make its “cheap” elastic carrying case seem only like a slight inconvenience.